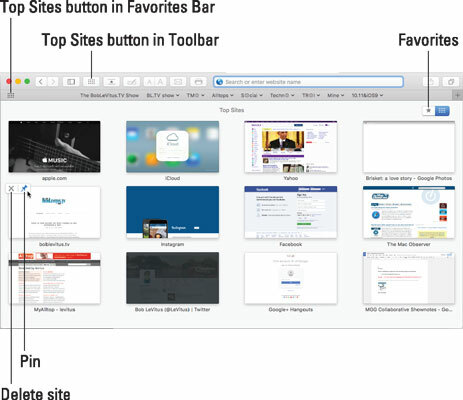 The Top Sites page in Safari, which is the web browser installed with OS X El Capitan, displays a selection of sites you visit frequently, as shown here. Top Sites displays your favorite sites. To see Top Sites, choose Bookmarks→Show Top Sites, or click the Top Sites button, which is on the left edge of the Favorites bar (View→Show Favorites Bar) and also on the customized toolbar (both shown in the figure). As you surf the web, Safari learns your favorite sites and replaces the sites on the Top Sites page with the ones you visit most. Delete a site you don’t want on your Top Sites page. Click the little X in its top-left corner. Pin a site to your Top Sites page to make it remain one of your Top Sites, even if you don’t visit that page for a while. Click the pushpin in its top-left corner so it turns blue, as shown. Change the number and size of the sites shown. Choose Safari→Preferences, click the General tab at the top, and then choose 12 sites, or 6 or 24 (not shown) from the Top Sites Shows pop-up menu.